LinkedIn launched its new API in November 2009, allowing any developer brave enough to implement OAuth to integrate with one of the largest social networks around. Seeking an opportunity to really understand OAuth more fully and play around with the LinkedIn API at the same time, I created the LinkedIn connect sample code. 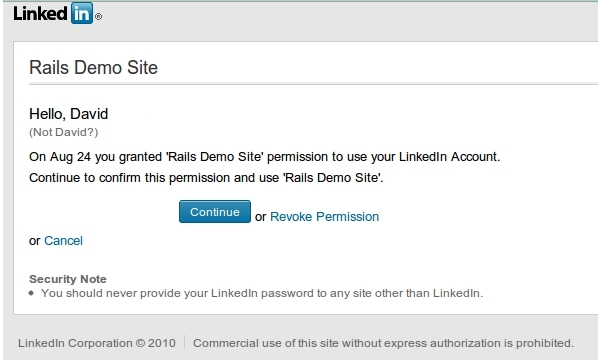 This is a sample Ruby on Rails tutorial to demonstrate how you can use the LinkedIn API to authenticate users and pull their profile data into your own website. 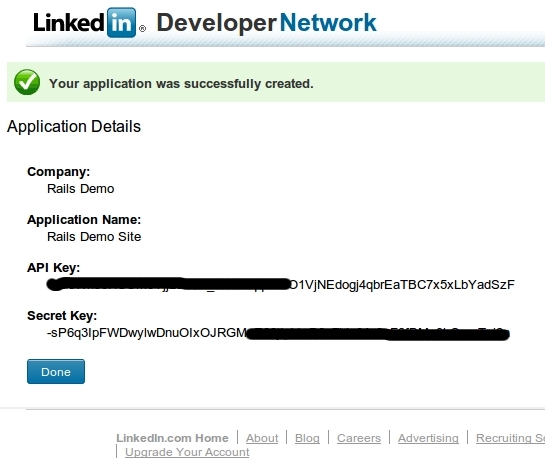 Before you can use the LinkedIn API, you'll need to set up your API keys. 3. After logging in, you’re now presented with an opportunity. You can create as many API keys as you like, one for each application that you create. Let’s get started. 4. This isn’t as complicated as it looks. Let’s look closely. 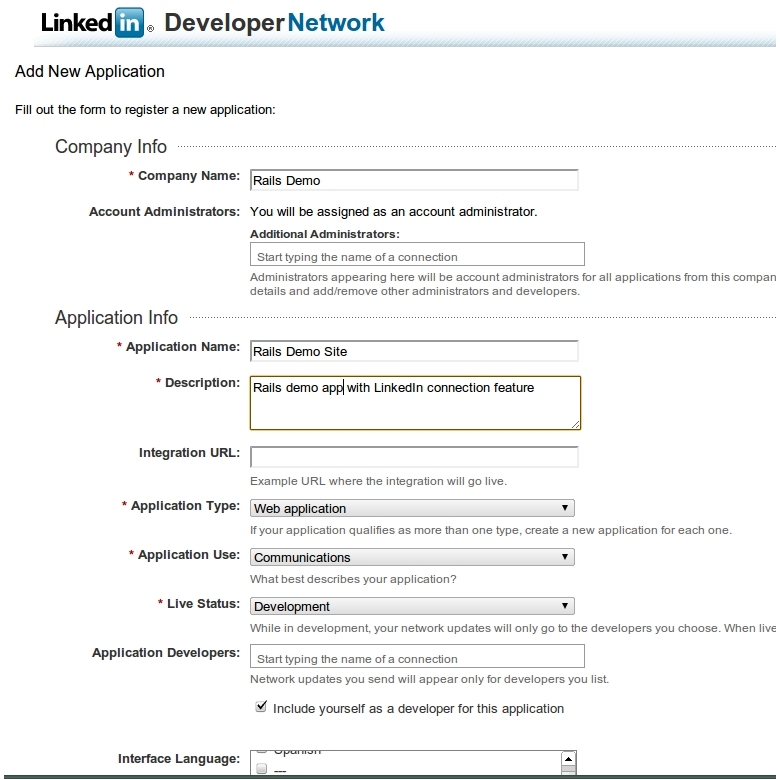 Application Developers: This is a list of your LinkedIn Connections that will receive network updates published by your application and is used only while it is in development mode. You need to be connected to any LinkedIn member that you want to put on this whitelist. 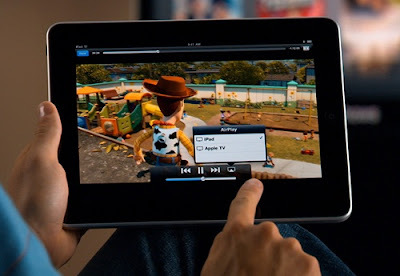 Interface Language: Your application is provided in one or more languages to end users. Let us know what those languages are so we can better support you in the future. Programming Tools: Knowing what kind of programming languages and tools you use to develop your application lets us know what languages and environments are most important for us to support. Just a few more fields to go over! Contact Info: Tell us how to get in contact with you should we have a question about or there is a problem with your application. OAuth Redirect URL: If you have a static location that should always be used for your OAuth callbacks, you can specify it here. It is recommended that you use the oauth_callback parameter in the appropriate requests instead. 6. You’ve got your API keys. What’s next? The LinkedIn Developer Network is where you’ll find guidelines, documentation, and growing community of developers. The private method "populate_oauth_user", which is called before user record created, and is used to fetch profile info (name, headline, industry, profile pic, public url, summary, specialties, web urls) in LinkedIn.com, and save these info to your user record. The other private method "populate_child_models", which is called after user record created, and which will save past position info (companies, job titles, durations, descriptions), education info (schools, degrees, field of study, dates, etc) and connections info (names, industries, headlines, profile pics) for user. You only need to save your objects this way if you want the user to authenticate with their OAuth provider. You should save your @user objects this way as well, because you also want the user to authenticate with OAuth. When the user click on the LinkedIn Login button and we can't find the oauth_token and oauth_secret in the database, the user will be redirect to signup page with "linkedin_user" parameter. After fill in the fields, they will be redirect to LinkedIn authentication page, then user record will be created. If we can find the oauth_token and oauth_secret in the database, the user will be login to the site. Now we have user's LinkedIn data saved in the database, so you can write some codes to show the user's LinkedIn profile data (such as Username, Headline, Location, Education, Position, Websites, Skills, Experience, Connections) in the website. You may want to add methods to update profile info on each login or update request. Or pull status updates, specialties, and current position for connection. If you're interested in learning more about LinkedIn and OAuth, I encourage you to checkout Taylor Singletary's presentation LinkedIn OAuth: Zero to Hero.